EDEM, a market leader in Discrete Element Method (DEM) technology for bulk material simulation, announces the release of the latest version of its flagship software. 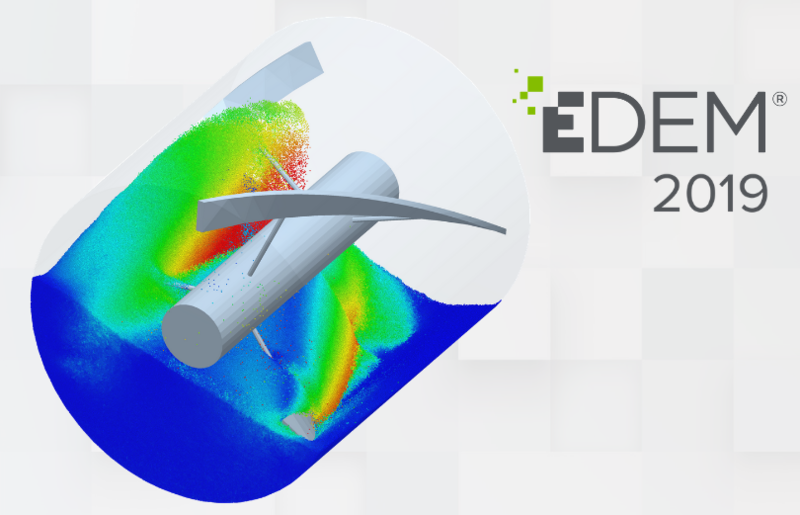 As the demand for performing big simulations involving millions of particles of any shape and size increases, EDEM continues to harness the latest GPU technology to enable users to run larger and more advanced simulations faster. In parallel, innovative features and tools are being introduced including a Python library for easier post-processing of large amounts of data, the ability to simulate deformable geometries as well as a new breakage model. EDEM 2019 officially introduces the EDEM multi-GPU solver engine. Using multiple GPU processors increases the maximum size of simulation which can be run on GPU, as well as increasing performance. This means users can run large simulations faster, but it also opens more possibilities to run much larger simulations which would not be possible on CPU only. Performance gains from adding a second GPU range between 30-90% depending on the distribution and size of the simulation. In general, the larger the simulation (over 1 million particles), the greater the benefit from multi-GPU. The multi-GPU solver is fully double-precision to guarantee accuracy and has been developed on OpenCL thus providing flexibility for users to use either AMD or NVIDIA cards. One of the key advantages of EDEM is the versatile EDEM API (Application Programming Interface) that enables users to write custom physics to model complex and advanced material behavior such as flexible fibers, sticky solids, and breakage. With EDEM 2019, API models can now be run directly on the GPU solver which means they can benefit from the performance boost that the GPU provides. Being able to simulate how a geometry is being deformed because of a bulk material acting on it is something that is of key interest for numerous applications and which has been under development at EDEM. The EDEM solver engines have been enhanced to facilitate continuous modification of a geometry structure during simulation. This means geometry sections can change shape and deform with input via the EDEM coupling interface. This enables users to directly couple EDEM to flexible body simulations to cover a wide range of applications such as belts, sheet panels, elastic membranes, and many more. Because of a partnership with FunctionBay, users of RecurDyn software will be the first to be able to use this capability in a coupled simulation. The ability to run larger simulations means that there is a high volume of data that is generated and processing that data can be difficult and time consuming for users. EDEM has developed a tool called ‘EDEMpy’ that can be used to process this large amount of data. EDEMpy is a Python library for post-processing and analysis of EDEM simulation data and takes advantage of the EDEM .h5 file structure. Using the library, it is easy to extract specific data from a simulation deck and process that data in a customizable and reusable way. Users can, for example, extract force acting on a specific geometry over time and compare results back to back between multiple simulation decks, track particles residence time over the course of a simulation, visualize networks of contacts and bonds in a new flexible way, visualize DEM data as a continuum or use EDEM data to calculate post processing properties for their simulations such as segregation index or tortuosity. EDEM is releasing a beta version of a new breakage model that can describe fracture of particles subjected to repeated loading by simulating both surface degradation and body breakage. This advanced model considers both catastrophic breakage (due to high impact) as well as surface breakage (due to abrasion). To develop this breakage model EDEM followed the latest advances in research and worked with experts in the field to deliver a robust model based on well-established and validated physics. The breakage model can provide key outputs related with the weakening of the particles and their related energies before and after breakage, as well as the final fragmentation and the size distribution of the fragments. This is the first breakage model able to address the different mechanisms of breakage including both surface damage and fragmentation.